Description: Come and tour this beautiful, all brick ranch home. This spacious home offers an open floor plan. 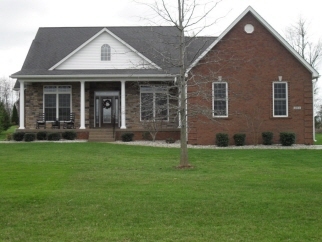 Home features include 4 bedrooms & 3 full baths on main level. Gorgeous hardwood & tile flooring, cathedral ceilings, granite counter tops & stainless steel appliances. The master suite features a beautiful trey ceiling, large jetted tub & a tile shower. The basement is finished and features a large family room w/built ins, an office and another possible bedroom & full bathroom. Other features include a fenced in back yard, alarm system, built in humidifier & water softener. Beautiful stained & stamped concrete patio. Data believed correct but not guaranteed. Buyer to verify data prior to offer. Agents read agent remarks.